We are engaged in offering Tile Making Machines, which are fabricated from quality components in accurate sizes and shapes to suit the application requirements. These are extensively used in producing tiles and paving blocks that find application in foot-path and car parking. In these machines, with colored pigments and gray concrete, long lasting color faces of tiles can be formed. After this, the high slump face concrete mix will be mixed in a separate tile mixer. We hold expertise in manufacturing Paver Block Cutting Machines that are widely used for cutting pavements and concrete blocks. 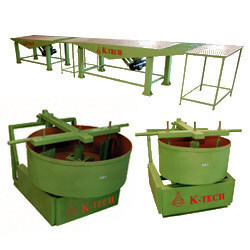 These machines are provided with desirable cutting block height and 4-side cutting edge. Our range of Paver Block Cutting Machines are hand movable and available in a weight of 30kgs. We are engaged in offering Pan Mixers, which find application in mixing moist concrete material for making blocks. These are manufactured using quality-tested components as per the industry norms and standards. These mixers are available in a capacity of 250kgs and are also provided with motor power of 10 hp. In addition, we can also do the customization of these mixers as per the client' specifications. We hold expertise in providing Floor Tiles Making Machines that are used to produce a wide variety of ridge tiles, arris tiles and colored tiles of various thicknesses with rich color and design. By pouring white cement concrete with color pigments and regular Grey color with two layers add attractive long lasting color interior flooring and wall faces. In a separate tile mixer, the high slump concrete mix is to be mixed. It can also be mixed with another tile mixer or regular drum type concrete mixer. We provide Vibro Forming Machines that are available for different production capacity, table and tile size. 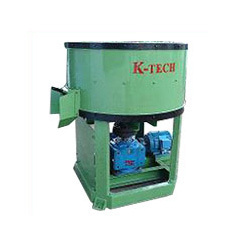 These machines are extensively used in construction applications and are also known for their durability, corrosion resistance, rugged construction and high tensile strength. Our clients can also avail from us these machines in different specifications as per their requirements. 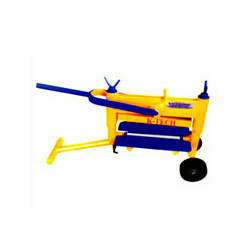 We are engaged in offering Tile Mixers that are used to produce tiles by pouring slump concrete in to rubber molds. These tile mixers are also provided with wear lining so as to ensure an effective and durable application. Our valuable clients can also avail from us The customization of these mixers as per their specifications. Looking for Tiles Making Machines ?